We get so distracted by the idea of the pilot and the aircraft decoupled from one another that we forget one of the other strengths of drones (at least of UAVs, the airborne variety): loitering time. This is the ability for a drone to circle above target individuals or places for extended periods of time. And by “extended”, I mean days. The Israeli “Heron” can stay airborne for 52 hours. Boeing’s latest effort boasts a loiter time of 10 days! More here. Pattern of life, i.e., what normally happens at this site? Maybe some “bad guys” meet there during the night, but it turns into a school during the day. This is actually a key plot point in Richard Clarke’s “Sting of the Drone”: a group of bad guys step up the propaganda value of collateral damage; they go conspicuously into a structure and exit elsewhere unseen. Unfortunately, the building is filled with a group of kids who’ve been duped into occupying the building (also unseen), which is demolished by a drone strike and subsequently deemed an “orphanage” and presented on video. Are all the bad guys here, or are more coming? Or are the ones here already going to leave? Will good guys show up before the bad guys leave? At any rate, the ability of a drone to loiter over an area or potential target is one of the key values of drone use, and that ability is continually being extended. The StratoBus dirigible promises to be able to do so for ONE YEAR (at 60000 feet). Speaking of blimps, this one can “only” loiter for a month, but it’s early days as far as counter-drones are concerned. As far as the label is concerned, this is mainly about watching for civilian drones, but it could end up being a Proof of Concept for more elaborate surveillance in potentially less-friendly environments. This was a much easier question to answer a few years ago when I’d begun capturing notes for this topic; before the proliferation of the technology and growth of the group of players (creators and buyers). As of a year ago, P.W. 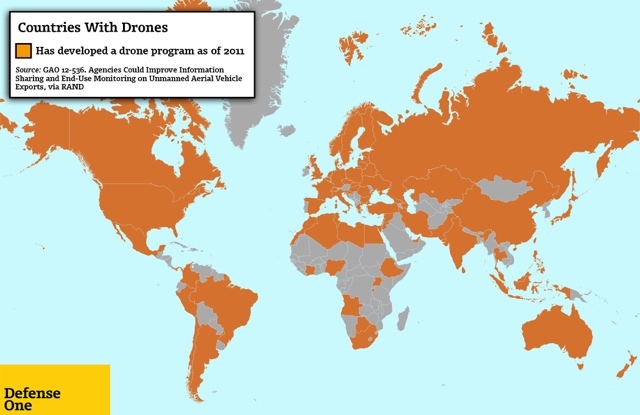 Singer estimated that 87 countries have UAVs. Defense One claims that within 10 years, “every” country (a bit hyperbolic, but perhaps not by much) will have armed drones. ” China uses them to spy on Japan near disputed islands in Asia. Turkey uses them to eyeball Kurdish activity in northern Iraq. Bolivia uses them to spot coca fields in the Andes. Iran reportedly has given them to Syria to monitor opposition rebels. But as for unarmed UAVs, there are already too many users and applications to enumerate; This article and the maps from Defense One will have to do. This is critically important; years from now, it could be viewed as one of the top features of (not all, but some) drones versus conventional aircraft, along with the decoupling of pilot/aircraft and loiter time (although in the case of swarming drones, the latter may for the most part not be one of those features). Imagine conventional methods for rapid target aquisition and destruction (for instance, the Phalanx gun). While these are very effective against a single moving target, but what would happen if a cloud of targets attacked (especially considering that individual elements of that cloud could be destroyed while leaving the whole swarm intact, or that the cloud itself could disperse and take on different “shapes”)? It is possible that the development of swarming technology has to date outstripped methods for defeating it. Another one I’m a late sharing speaks to the military’s pursuit of swarming technology. It was when I saw the World War Z trailer (haven’t seen the movie and not interested, but highly recommend the book, particularly in audio) that I realized how mainstream swarms could be. It adversely impacts the morale of the target.